A process handle is an integer value that identifies a process to Windows. It acts like a pointer. The Win32 API calls them a HANDLE; handles to windows are called HWND and handles to modules HMODULE. Threads inside processes have a thread handle, and files and other resources (such as registry keys) have handles too. If you do not release your handle to a resource, other people may not be able to access it – this is why you sometimes cannot delete a file because Windows claims it is in use. Example of such a case can be a broken installer. The setup terminates, but the handle is still open. Then you’ll notify that you can’t delete some files or folders that were previousely created by the installer, because they’re locked by the handle. 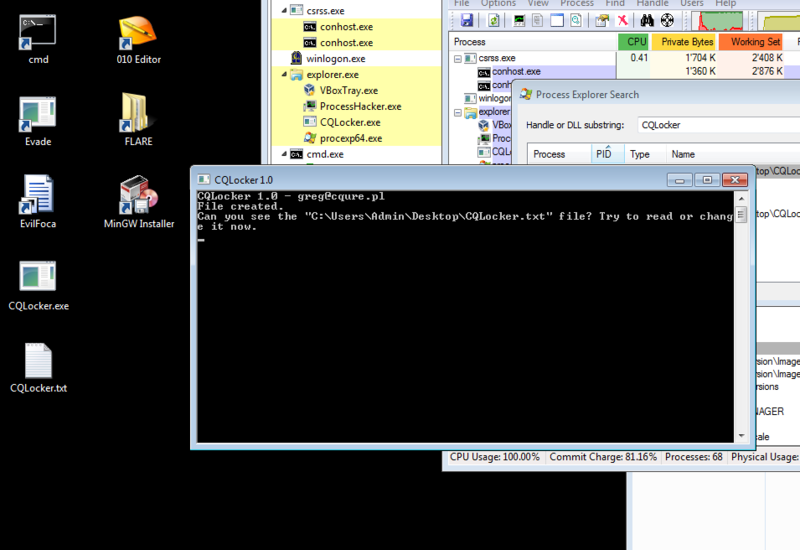 Let’s open a file called notes.txt with winword.exe. 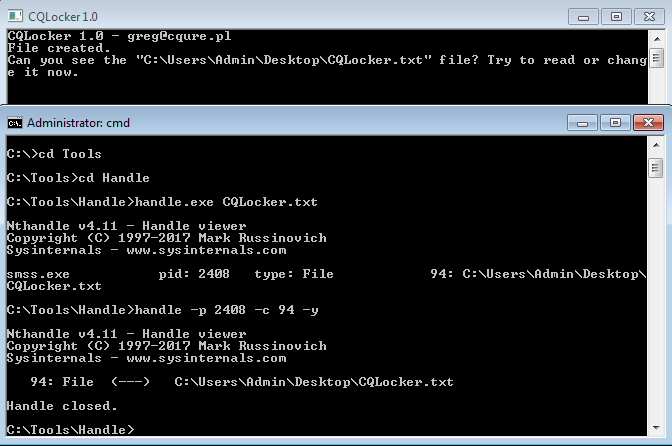 If we do a check with the tool handle.exe for the file notes.txt we can identify the process handle who locks the file. We can now try to close that handle, but we have to be very careful with that. Closing handles can cause application crashes or system damages. 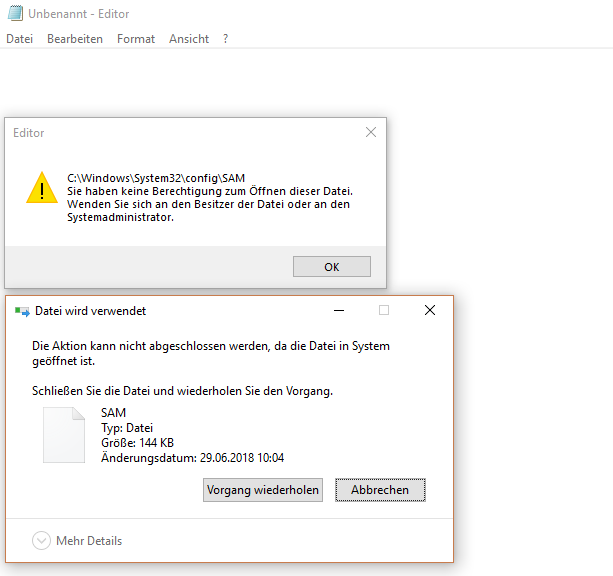 If we want to try to access or copy the SAM (Security Access Manager) Database/System file we notice that it is not possible in a running windows session! A solution for accessing the SAM Database could be boot up a live system and copy the file, but there’s another cool trick that I’ve learned. If we only need to read a file we can copy it from a snapshot instead of a live file. Operating System keeps Snapshot of the system! If we have our snapshot we can map that snapshot and copy the SAM and System file from there. 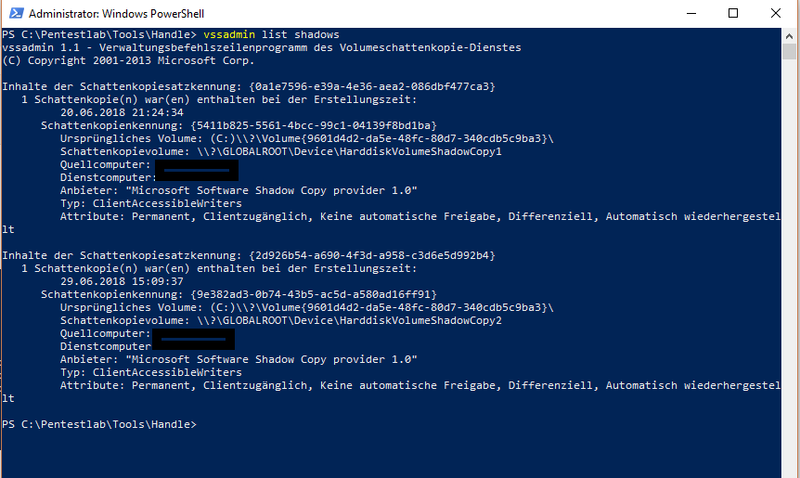 mklink /d C:\Shadowcopy "Shadow Copy Volume\"
Can you see the „CQLocker.txt“ file? Try to read or change it now. Very similar to the case above! 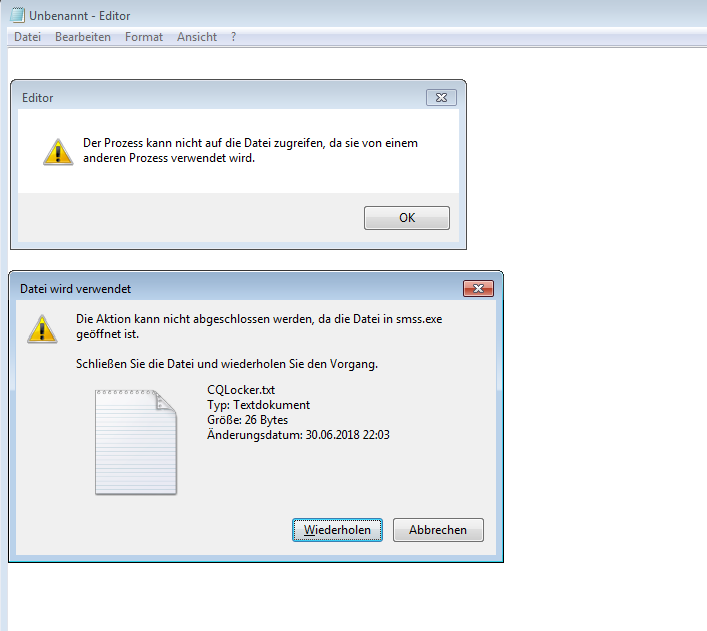 Let’s try this time to close the handle with processexplorer. What happens if one process opens a file for writing and later, another wants to read the same file? It all depends on the process which asked for a handle for writing. What happens when you terminate the process owning a handle? Does the handle.exe utility from sysinternals allow to list handles owned by particular process? Which GUI Tool may be used for finding handles? What can happen if you close the handle owned by another process?